I just heard there's a tornado watch in our area. I don't see one out there, though, so it seems a waste of time to sit here and try to watch it. Now, back in my college days, at University of Georgia, we had this one tornado warning — a twister had reportedly touched down very close to campus. In Georgia, tornadoes are something to take seriously. Gainesville, where my mom grew up, was utterly destroyed by a tornado in 1936, when she was very young. 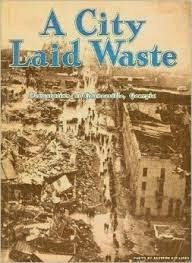 One of my relatives, William M. Brice, wrote a book about the tragedy, called A City Laid Waste. In the instance at hand here — 1980, I believe it was — because this tornado was in view of the UGA campus, the powers that be paraded the residents of my dorm down into the basement of the building, where it was supposed to be safer. Well, if you were on one side of the wall down there, it might have been safer, but in the common area, where I and several friends were sent, there was a bank of plate-glass windows that faced the lower parking lot. When my roommate, Steve, and I realized we were being set up to become shredded southern-style barbecue should that tornado come through, we decided we weren't going to stay there. I shall not right here admit to having done certain mind-altering substances in college, but I will say that I did have a rather different mindset then than I do now. Rather than seek a more suitable place of shelter, Steve and I hit the street and went looking for the offending windstorm. The sky was black, pink, and green, and there was a prodigious wind pummeling us, but I think we walked a mile or so around campus, searching, searching, searching. Never did find that tornado. I don't know that I was disappointed, necessarily, though I might not have complained too much had the thing come through and taken down my dorm building. The bathroom kind of sucked. I wonder if this old image will spark any memories from members of the generation to which I belong, at least in body. 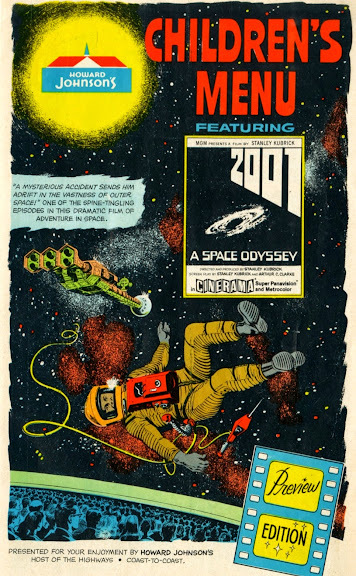 It was, to the best of my recollection, my first exposure to the film 2001: A Space Odyssey, which I still consider among the most convincing and engrossing space movies ever made. During my childhood, even on into young adulthood, my family traveled to Georgia from our home in Virginia several times a year to visit both sets of grandparents, and stopping at Howard Johnson's — they were ubiquitous in those days — somewhere on that long trip was tradition with my folks. 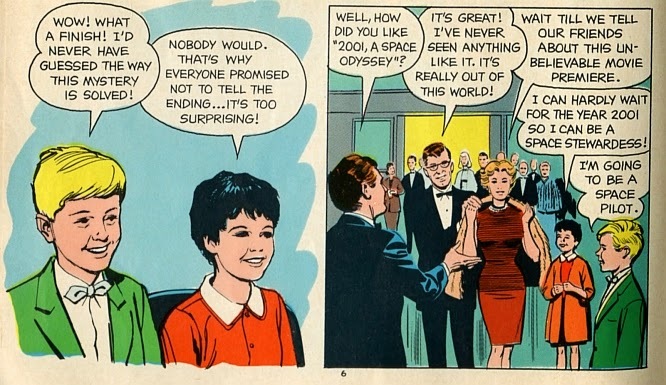 I remember ever-so-well on that trip in late 1967 being handed this children's menu, which was essentially a comic book of the movie, shown from the perspective of a couple of insufferable young brats who go to the movie's premiere. 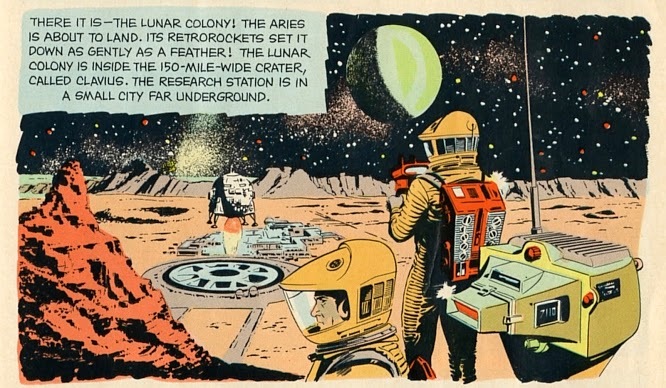 The comic offered the most terrible distortion of the film's story, as such comics were ever wont to do, but the art was quite good, most of it clearly based on pre-production stills from the movie. 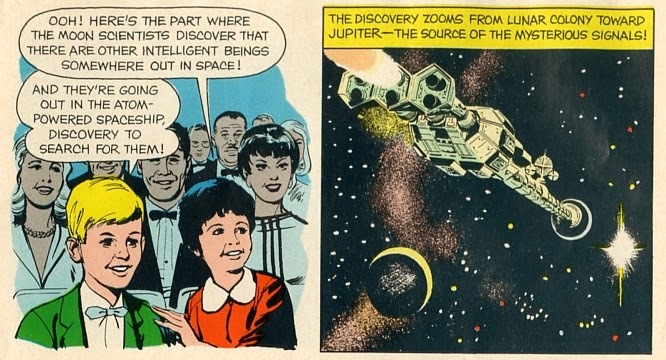 Naturally, in the comic, nary a hint of 2001's surrealistic style or philosophical undertone was in evidence; it was all made out to be a charming space adventure that would thrill and excite insufferable young brats, including me, the whole world over. It was a silly, primitive, ridiculous marketing tool that was characteristic of marketing tools back in the 50s, 60s, on into the 70s. Back then, movie studios pulled out all the stops to draw in young seekers of cinematic thrills, and I certainly fell into that category. I was eight years old when I saw 2001, and though its finer dramatic aspects were almost certainly lost on me, I remember having the hardest time believing that what I was seeing wasn't actually real. The movie systematically shattered every preconceived notion I had, virtually all of which had come directly from the Howard Johnson's comic. I immediately fell in love with the movie, and I think I saw it on the big screen a half a dozen times over the next couple of years (back then, movies were also re-released to theaters for second and sometimes third runs). Arthur C. Clarke's novel was one of the first, if not the first, adult novels I ever read. I was only in third grade at the time, but I don't remember having any difficulty comprehending the words, if not necessarily the context of the book. That Howard Johnson's menu comic, which, prior to seeing the movie, I had held in the highest esteem, became almost an object of contempt, and I suspect that at some point in my less-than-farsighted youth, I dumped my copy in the trash. How I wish I still possessed that old thing now. But a few years ago, I did discover, much to my satisfaction, that the comic was reproduced in its entirety online. Oh, happy boy, me. At least, a few years after that — 1977, I think — I did have the foresight to preserve my copies of that wretched Godzilla vs. Megalon comic that came out along with the film. 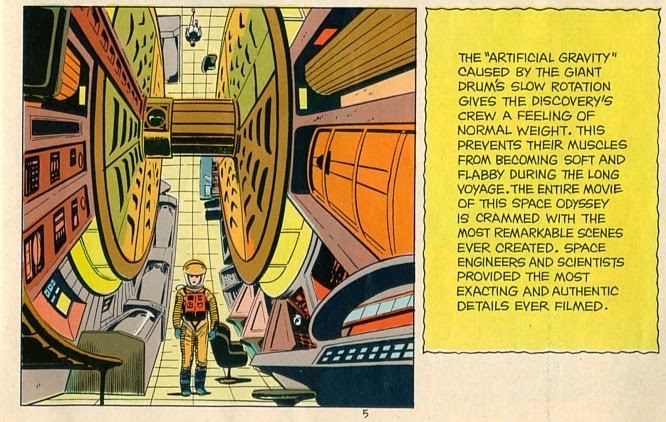 A few sample panels from Howard Johnson's 2001: A Space Odyssey children's menu follow. I've posted numerous times about the Indiegogo campaign for World War Cthulhu, the Dark Regions anthology edited by Brian Sammons and Glynn Owen Barrass, which includes my story, "The Game Changers," and here's another one for you. The campaign for World War Cthulhu has now ended, having become one the most successful for any book to date, with 233% of its $10,000 target raised. Due to this success, not only will several custom editions of the book be released, along with numerous perks for campaign contributors, the length of the anthology can be increased to accommodate a few tales the editors initially had to withhold due to space limitations. Having had little other experience with crowd-funded projects, I wasn't sure how such a thing might actually go. Needless to say, I'm thrilled that World War Cthulhu zoomed over the top and then some. Crowd-funded efforts — be they for books, music, movies, and just about any creative endeavor — are popping up everywhere, offering opportunities to creators where opportunity might otherwise be scarce. At the same time, it is tiresome to forever bombarded by "invitations" to contribute to any and all endeavors with which I might have only the most tenuous connection, if any. While crowd-funding does rather democratize the process of determining which efforts will see the light of day and which won't, to my mind, entities and individuals who embark on such campaigns need to have already built some degree of trust with their audiences — Dark Regions, for example, has been around for many years and has produced tons of first-rate products — for the opportunities for fraudsters are also plentiful. Safeguards for investors may vary wildly, depending on who has ultimate responsibility for the project. The Indiegogo campaign for World War Cthulhu is over, so the window for all those custom perks is closed, but the standard edition will be available as an e-book, a trade paperback, and deluxe hardback. Authors include Neil Baker, David Conyers, Tim Curran, Ed Erdelac, Cody Goodfellow, Ted Grau, C. J. Henderson, David Kernot, William Meikle, Christine Morgan, Edward Morris, Konstantin Paradias, Robert M. Price, W. H. Pugmire, Peter Rawlik, John Shirley, Darryl Schweitzer, Jeffrey Thomas, and Lee Zumpe. Cover art is by Vincent Chong, interior illustrations by M. Wayne Miller. Visit Dark Regions Press for more info. 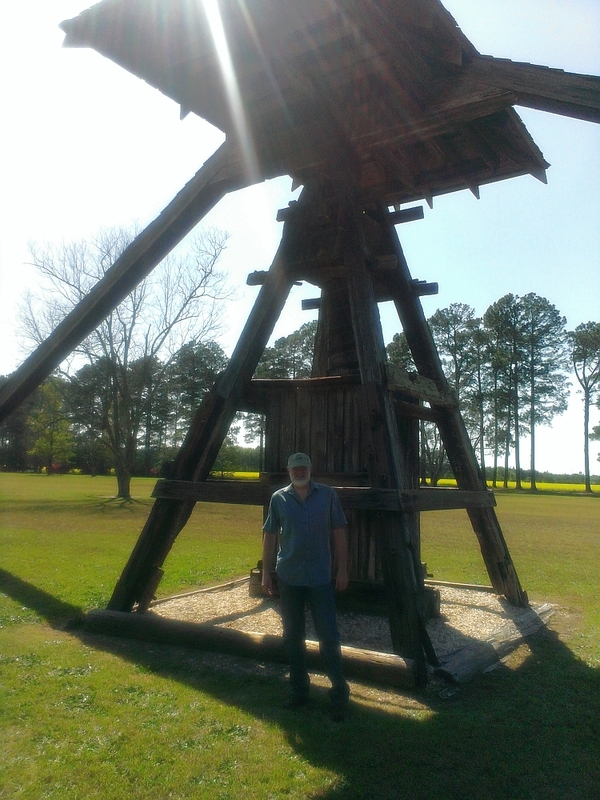 The contraption you see there is an old cotton press, very near nowhere, South Carolina, which one passes when traveling Highway 38 between Hamlet, NC, and the junction of US Highway 501, in our case on the way to Myrtle Beach, SC. Of course there is a geocache here (GC47CA4), and Ms. B. and I actually ran into another couple of cachers here on their way home from the beach. 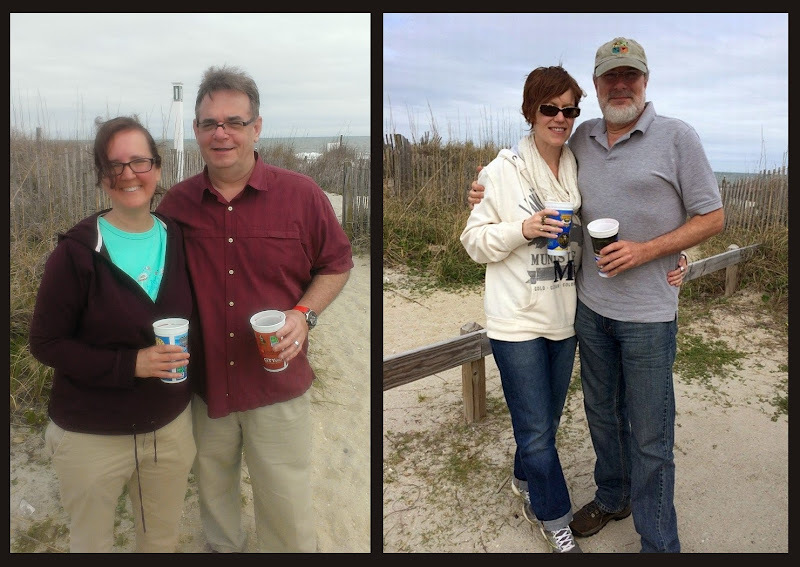 It's been some years since we've been able to get to the coast, but our friends Joe and Suzy Albanese, and their son Sam and friends, were in Myrtle for a few days and had a place with enough room in the crawlspace for us to crash, so we decided to inflict ourselves upon them. Ms. B. and I got down there Thursday evening and returned today — unfortunately, in a pretty good downpour most of the way home. Fortunately, while we were there the weather was chilly but mostly clear. I was surprised by the number of folk — mostly young, of course — who were actually out swimming in the ocean or otherwise dressed for summer weather. That water had to be damn near polar plunge frigid. 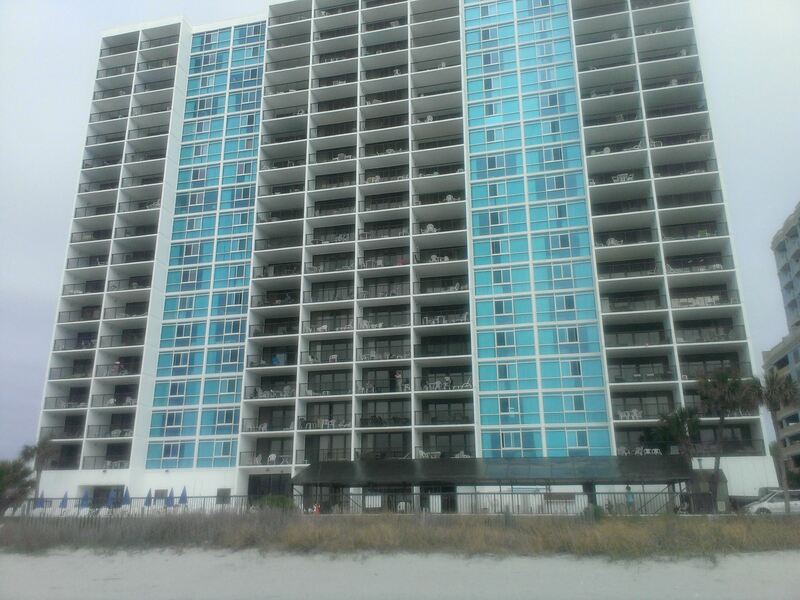 For the years between 1977 and 2000, my folks owned a timeshare condominium at Regency Towers on the south end of Myrtle Beach, and Ocean Lakes campground, where we were staying on this trip, is only a couple of miles from there. How nice it was to find that a geocache resides right at Regency Towers — along the wall where I used to regularly sit, playing my guitar and frightening the beachcombers. Kimberly and I headed over there straightaway yesterday morning, found the cache, and walked up the beach toward another cache nearly a mile to the north. Chilly but nice, and it was kind of bittersweet to be out on such a familiar and yet very changed stretch of oceanfront properties. Regency Towers; my family used to have a time-share here. No longer, but there is a geocache nearby. Being that many kids are out for spring break, Myrtle was very crowded, almost as crowded as when we used to go during the prime weeks of summer. Ocean Lakes is basically a community unto itself, enclosed and relatively serene; for us, buzzing around the premises in the Albaneses' golf cart was kind of a highlight, especially on Thursday night, when just about everyone there paraded the streets in their carts, some decorated and illuminated in fun ways. The young children that abounded were clearly enjoying it all no end, and for at least that evening, I actually felt an uncharacteristic lack of hostility toward the younger set. Now that, I tell you, is the old man at his most mellow. 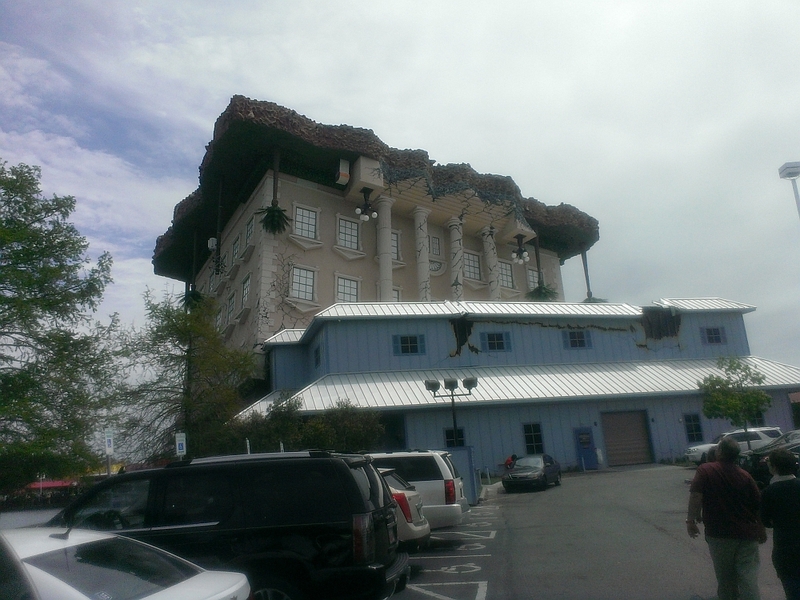 Yesterday afternoon, we visited Broadway at the Beach, which is kind of a souped-up replacement for the old pavilion that was once the big bright tourist spot in Myrtle. There's a winery there — The Boardwalk Winery — but we're not talking any kind of fancy or sophisticated stuff here; they specialize in wines that are sweet to semi-dry, and they even feature novelties such as wine slushies (in non-alcoholic varieties for the youngsters). Their dry reds — Syrah, Sangiovese, Merlot, and a blend — are described as "young," and as to their quality, I'll elaborate no further. 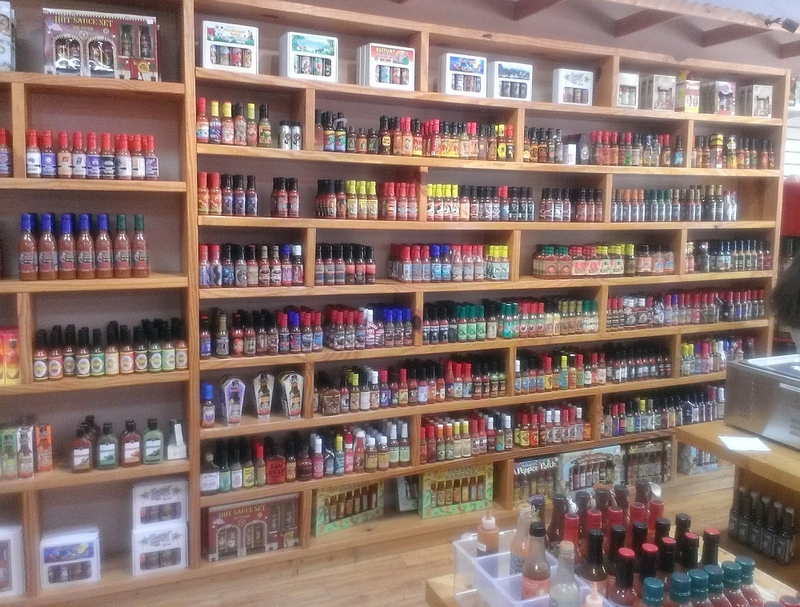 The highlight of this Mecca for tourists, apart from a couple of caches, is the Pepper Palace, a fairly extensive hot sauce shop that offers lots of free samples. As tempting as it was, I didn't buy them out, but after several samples, I left with sufficient inner fire to brace me against the chilly evening wind. Dinner last night was in Murrell's Inlet, at Russell's Seafood Grill and Raw Bar, a place I had been once before, several years ago, but I remembered little about the quality of the place. Mercy, but last night I loved this restaurant; I think we all did. 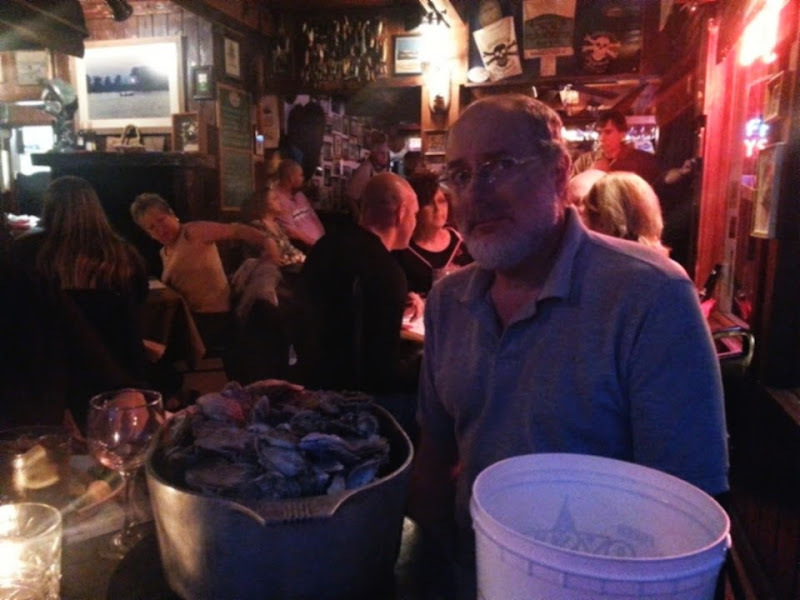 I ordered a peck of fresh, local oysters, and I've gotta tell you, a peck of steamed shellfish is nothing to sneeze at. It's a huge freaking pot of the best oysters I think I've ever tasted, with plenty of melted butter, cocktail sauce, tabasco sauce, and horseradish to accompany. In fact, though I'm rarely fond of naked oysters, these guys were delicious straight out of the shell, dipped in nothing. To finish them, I did need some help from Joe and Suzy (Kimberly is not a connoisseur of shellfish) but at the end of the evening, that pot was empty. Kimberly and the Albaneses all enjoyed their dinners; between us, we sampled a pretty fair portion of the menu. Service was excellent from top to bottom — the owner greets you at the door; the lady bartender was as professional, amiable, and efficient as any I've ever seen (she made a damn fine gin martini); and our server was friendly, prompt, and conscientious. We did have to wait almost an hour for a table, since everyone in South Carolina was dining in Murrells Inlet last night, but we didn't mind a bit, as the company, drinks, and ambiance were better than fine. The restaurant's interior has the quintessential "beach tavern" atmosphere, and they do have a balcony with outdoor seating, though the weather allowed for none of that last night. I'd say dinner at Russell's was beyond satisfactory, and all for less-than-extortionate prices. Today, it was a rainy drive home, with only a few caches on the menu — though, amusingly, ten minutes after I found a cache just outside of Myrtle Beach, I received a call from local cachers c3 and Norah, who had just claimed the same cache on their way to the beach and retrieved the geocoin I had just left there. Too bad our paths didn't actually cross. That would have been just plain decent. Back in my teenage years, and even some thereafter, going to Myrtle Beach was something of a dream vacation. The place has grown so much over the years, and the dense traffic and endless stoplights become outright stressful, so for me personally, Myrtle doesn't hold the kind of charm it used to. 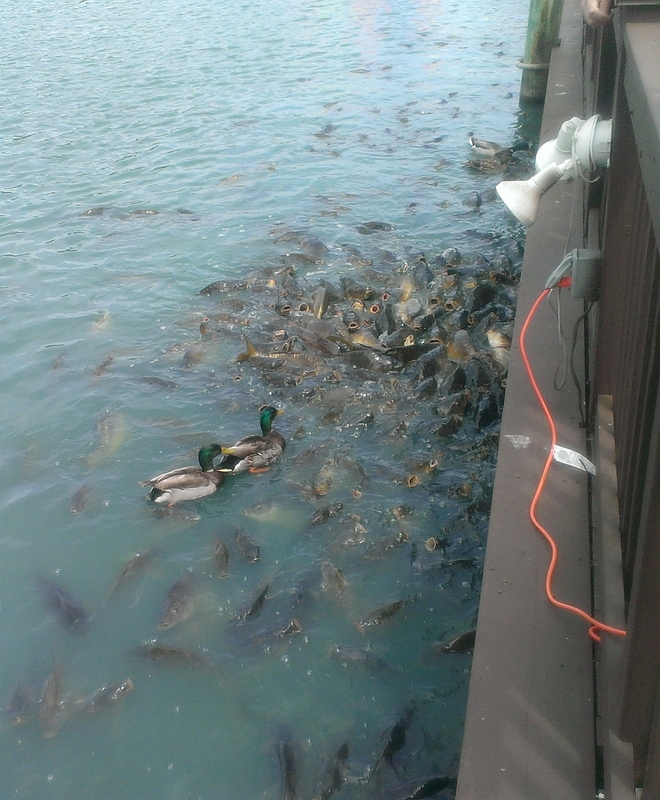 But this trip was so enjoyable and filled with such good company that it was kind of like a return to youth. I just loved it, and I hope Ms. B. and the Albaneses can say the same thing. Left: The Albanese, not necessarily scary; Right: Ms. B. and Old Rodan, pretty scary. Old Rodan might be a little afeared of that peck of steamed oysters on the table. Today is 7 years since our little cat Charcoal crossed the Rainbow Bridge. She was the sister of Dusty, who passed away just a few months ago at age 16. Of all the critters with whom I have ever crossed paths, Charcoal was just about the sweetest. She had lived a relatively brief 8 years when she was diagnosed with a tumor in her sinus cavity. She didn’t last long after that, and burying her out in the back yard was one of the hardest things I ever had to do. I still miss her every day — along with all my other dear animals that are no longer with me. 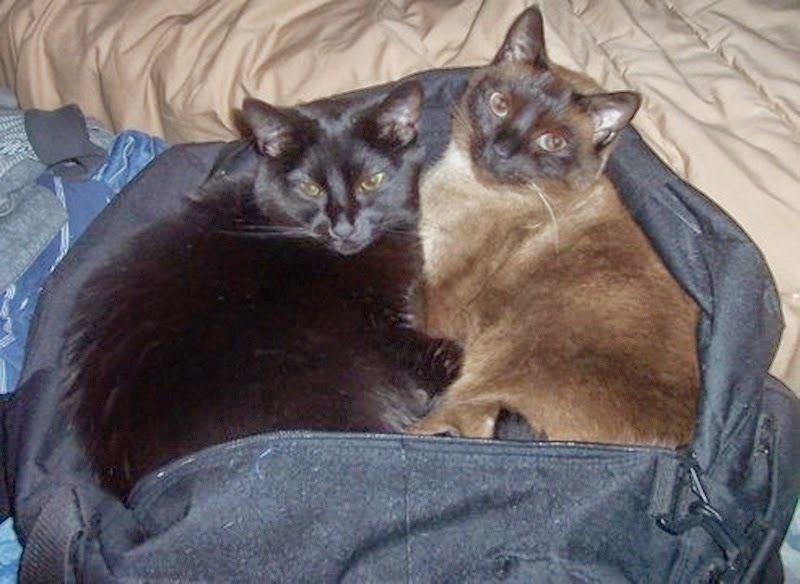 At any given time, whatever Chester, the Siamese, was doing, that’s what Charcoal had to do. She loved him terribly — sometimes so much that he would come running to me to get her to leave him alone. 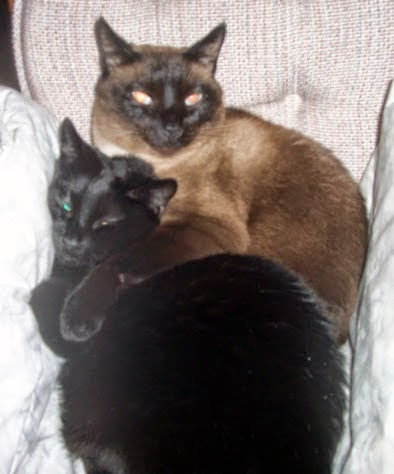 There was never much I could do about this, but when she got tired of smushing Chester, she enjoyed smushing me. During the cold months, whenever I would sit at my desk, she would come and lie on my feet to make sure they were warm. I certainly never got cold feet! I miss you, little cat. So I found geocache number 6,900 today (plus a couple), and I figured I'd start thinking about which cache I might target for my 7,000th — which prompted Ms. B. to call me a caching geek. Oh, what a poor soul! What a poor, unenlightened soul that fails to grasp the joys and challenges of finding and autographing log sheets in odd little containers that lurk in various and sundry entertaining locations. I mean, the experience of visiting a winery, such as Childress Vineyards in Lexington, is only made sweeter (or dryer, if you're like me and dislike sweet wines) when there's a cache waiting for you right there on the spot ("Enough of This Whining," GC3V1VG). How do you fully appreciate going shopping for home stuff with hysterical Swedish names at Ikea in Charlotte if you don't snag a cache or two in the process — particularly when one of them has additional, challenging logging requirements you have actually met ("The 366-Day Challenge," GC1XYQ4)? Can one really say one has had a satisfying dining experience at a restaurant such as 300 East in Charlotte's Dilworth district without conquering at least one of the nearby cache hides, such as "Artattack" (GC25V6H), or perhaps "I Have a Dream" (GC4M36T), which requires studying Martin Luther King's famous speech to calculate the coordinates for the actual cache hide? Why, I'm not sure one can. 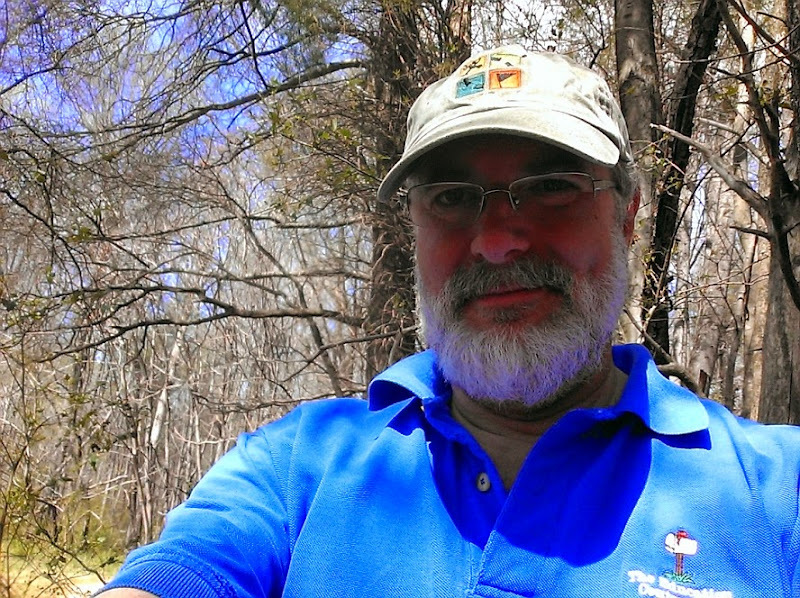 My gracious, a caching geek? Okay, sure enough, but I tell you this — on a day like today, one of us is a great big happy caching geek! Well, in spite of her non-geocaching tendencies, Ms. B. is still a pretty danged good girlfriend. 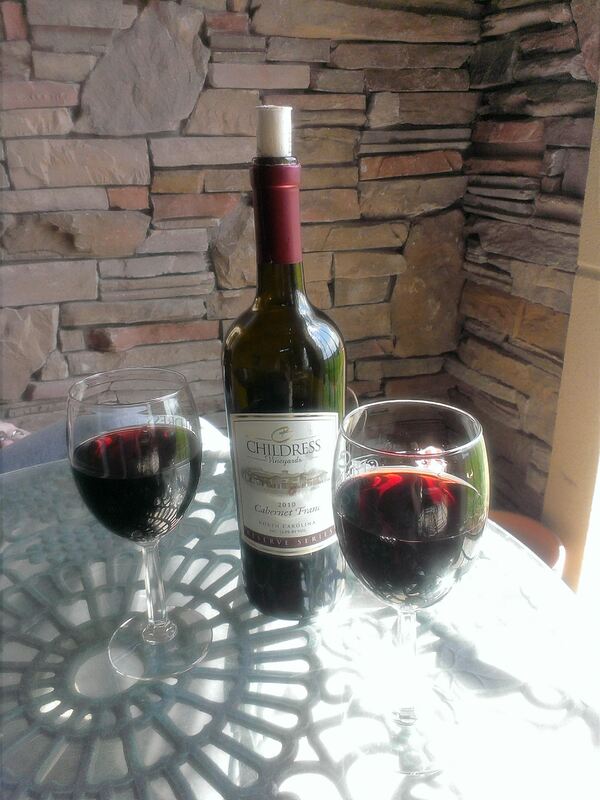 Maybe if I whine enough... er... wine her enough... she'll come around. Surely, this is only proper. I don't recall with any clarity when I first read Robert W. Chambers' series of King in Yellow stories; it was probably sometime in the late 1980s or early 1990s. I can't say they grabbed me. I understood that these tales influenced H. P. Lovecraft, and that they themselves borrowed names from stories by Ambrose Bierce, whose work I had enjoyed since I first read it in college, but Chambers' prose — typical late Victorian era — and the themes of his stories failed to engage me as did the fiction of Bierce or Poe or Wells or Lovecraft, whose authorial voices, to me, tonally enhanced their works. For several years afterward, I thought very little of The King in Yellow. Then, in 1997, there or about, the good Dr. Robert M. Price edited an anthology for Chaosium's Call of Cthulhu fiction line titled The Hastur Cycle, which featured a couple of Chambers' stories — "The Repairer of Reputations" and "The Yellow Sign" — along with numerous other tales that used Chambers' work as a backdrop or jumping-off point, written by such familiar authors as H. P. Lovecraft, Karl Edward Wagner, Lin Carter, and others. While Lovecraft's "The Whisperer in Darkness" only obliquely referred to the King in Yellow mythos, as many of the tales in the book revolved around it as around Chambers' own. This is no doubt because, once elements of Chambers' work found their way into Lovecraft's, it was inevitable that August Derleth and others might appropriate those elements and dilute or remove whatever essence might remain of Chambers' original. However, from this volume, two stories in particular caught my notice and gave me an entirely new appreciation for Chambers: James Blish's "More Light," which included an entire script — or most of one, anyway — of the play, "The King in Yellow"; and Karl Edward Wagner's "The River of Night's Dreaming." Now, you may well know that Chambers' stories are founded on this play of his own creation, but like Lovecraft's Necronomicon, it existed only in fragments, with virtually no context. All we know from Chambers' work is that reading the play leads to madness or death. We know that it includes characters such as the inhuman King in Yellow, Cassilda, Camilla, the Phantom of Truth; and locations such as Carcosa, Hastur, the Lake of Hali, Alar, Dheme, and Aldeberan. We know that the play's first act is so mundane as to induce boredom, while reading even a few words of the second act inexorably draws in the reader and drives him or her mad with its revelations of "irresistible truths." Blish's "More Light" was, by the author's own admission, ambitious and doomed to failure, yet the script he concocted, while hardly sufficient to drive one mad, possessed an allure that, for me personally, became the "King in Yellow," the play that Chambers himself could not and would not have attempted to write. Lin Carter built on Blish's story by turning a portion of the script into actual verse, though not very memorably. Chambers himself referred to Hastur specifically as a place, while Lovecraft left references to Hastur ambiguous, open to readers' interpretations. Derleth, however, made Hastur into another Great Old Entity, weakening, if not entirely severing, any connections to Chambers' mythos. Lin Carter attempted to reconcile these disparate interpretations, resulting in a few fragmented pieces that Price published under the apt title "Tatters of the King," but this attempt, while perhaps noble, proved ultimately underwhelming. Wagner's "River of Night's Dreaming" merged contemporary reality both with aspects of the play and the speculative history that Chambers devised for his interrelated stories. Wagner's story, with its vivid imagery and memorable characterizations, haunted me much as had Blish's, and it was these tales that prompted me to revisit Chambers' original work. With so many intervening years since my first exposure to that small body of King in Yellow tales, and now armed with new appreciation for the subject matter due to the work of these later authors, in rereading Chambers, I found myself drawn into a domain so surreal and tragic that I actually found it emotionally draining — particularly the story "The Yellow Sign." While no script could possibly live up to the power attributed to it, Blish's version — which is to some (myself included) canonical — created a foundation for Chambers' tales that he himself had never imagined. This foundation is hardly necessary, but its best, most important function may be that it drives one to take another look at and even re-evaluate Chambers' original stories. Taken together, many of the various works in the King in Yellow cycle seem to offer glimpses of a realm that is not a single author's creation, but that exists and permits assorted authors to glimpse and then reveal small portions of it. 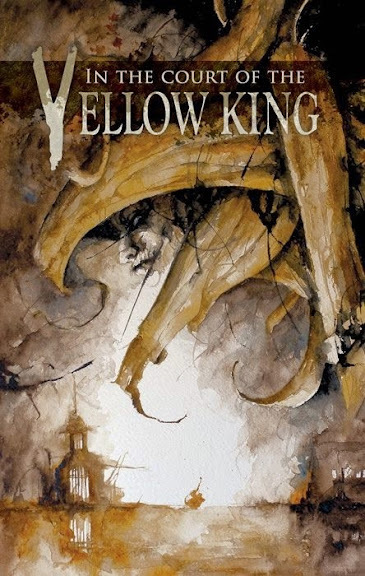 In more recent years, the King in Yellow has enjoyed some resurgence in the dark fiction community and has inspired many new works by numerous authors, such as Joseph S. Pulver Sr., whose collections Blood Will Have Its Season and Sin and Ashes, as well as the anthology, A Season in Carcosa, which he edited, have enjoyed considerable acclaim. Now, editor Glynn Owen Barrass has assembled a new anthology titled In the Court of the Yellow King, due in fall 2014 from Celaeno Press. 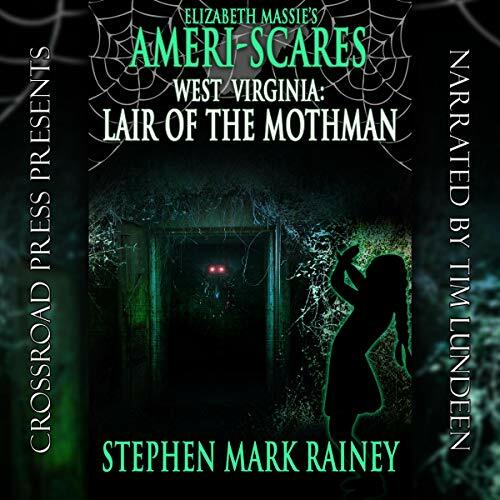 This volume includes my story, "The Masque of the Queen," as well as new work by many names familiar to aficionados of Chambers and Lovecraft — not to mention from the pages of Deathrealm — such as Willie Meikle, Christine Morgan, Edward Morris, Robert M. Price, W. H. Pugmire, Peter Rawlik, and Jeffrey Thomas. The cover, shown above, is by award-winning artist Daniele Serra. You can read more about In the Court of the Yellow King from Celaeno Press here. I will post any and all updates about the book here, so... as always... do stay tuned. A Car Deal for You! 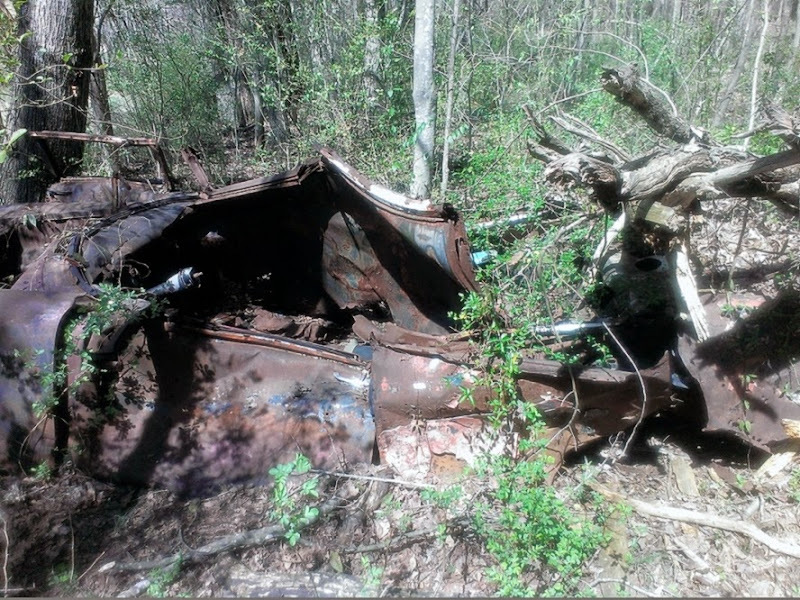 I had just come upon this slightly distressed vehicle in the woods when my phone went off — an email from Groupon reading "A Car Deal for You!" and, damn, yes it was! A bit of a fixer-upper, I guess, but there's a geocache here, and I did jump right on it. No resting on my laurels today. 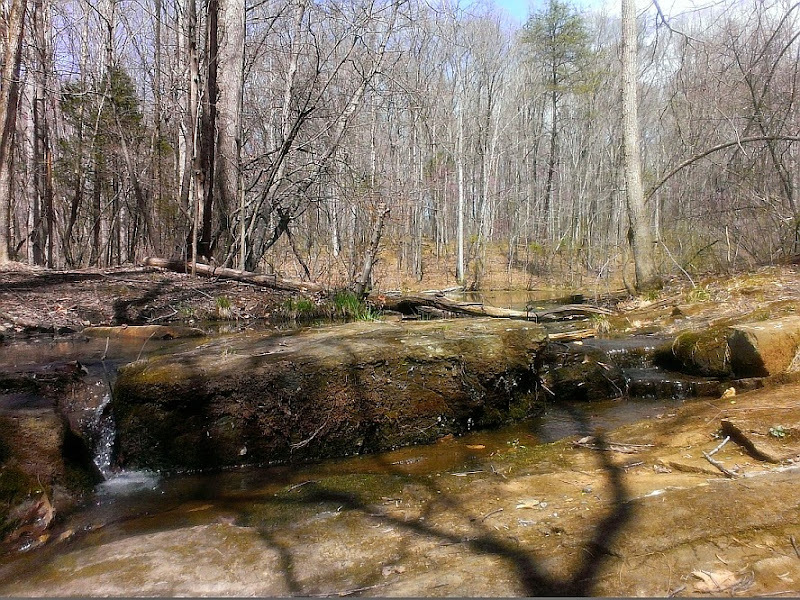 Spent most of the day in the lower southwest corner of Winston-Salem, getting in quite a bit of caching and hiking. Now I is sore. 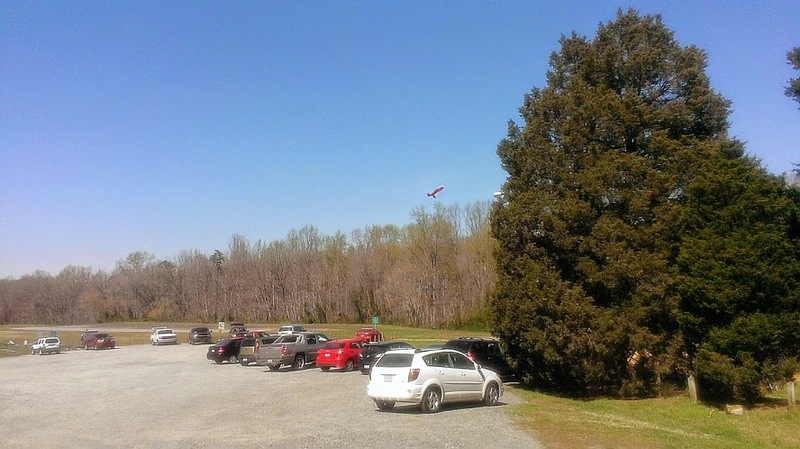 Lots of radio-controlled planes buzzing over at Hobby Park this afternoon.